Doodle Therapy: A Worry Box | CHRYSALIS HOUSE, INC.
For millions of children, worry and anxiety can be a real but absolutely normal problem. Worries that fall within what we consider to be “normal” limits – can still negatively impact a child’s ability to play, interact with others, focus on schoolwork and even sleep. 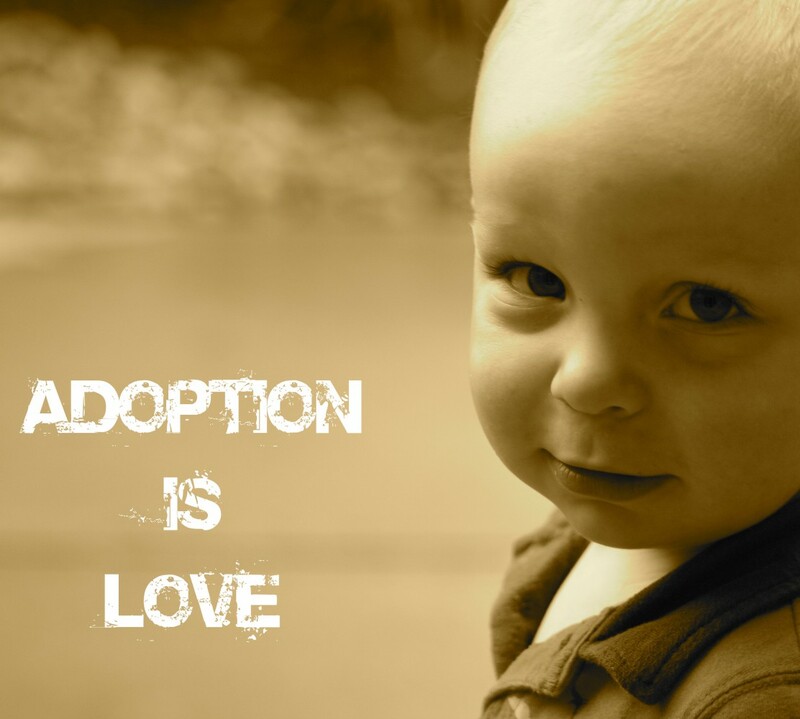 However, for children coming from adverse backgrounds – more intense worry and anxiety can occur. This stems from an acute stress response, which ultimately causes the child to respond with more intense hypervigilance and fear.Today, I’ll be sharing a creative activity and tips to help you begin addressing the worries of the child in your care. Expressing irrational fears or concerns about their own safety or the safety of others. Having difficulty falling and staying asleep. Feeling too concerned with the opinion of others, perfection or people pleasing. Excessively worrying about or refusing to go to school. Experiencing symptoms such as frequent upset stomach or headaches. (These, of course, can be signs of other ailments. Be sure to consult your child’s physician. Feeling overly self-conscious, doubting themselves or having unrealistic expectations of themselves. To be diagnosed as an anxiety disorder, the above symptoms must cause severe distress in the child’s life and interrupt normal functioning. Generalized anxiety disorder is characterized by excessive, exaggerated anxiety and worry about everyday life events with no obvious reasons for worry. People with symptoms of Generalized Anxiety Disorder tend to always expect disaster and can’t stop worrying. Daily life becomes a constant state of worry, fear, and dread. Eventually, the anxiety so dominates the person’s thinking that it interferes with daily functioning. These symptoms will be present for most days for at least 6 months. It’s important to be aware that extreme worries may require services from a professional to fully overcome. Please also discuss any overt concerns or questions about your child’s anxiety with your CHI social worker. If I should notice these types of symptoms in my child, what should I do? The most important thing that you can do is talk with your child, remembering that an anxious child will likely have a hard time expressing themselves. They may not know what “it” is that they are specifically anxious about. It is helpful to ask questions and get the child to be as specific as possible about what worries him or her. This is where a Worry Box can help. Writing worries down on a small piece of paper encourages your child to get right to the point of what is bothering him or her. Then, by creating a time and place to talk about his or her feelings, the Worry Box can help you open up lines of communication that are otherwise difficult to establish. That communication can go a long way to helping your child be able to manage worries better and give you an insight into how he or she is thinking and feeling about life. 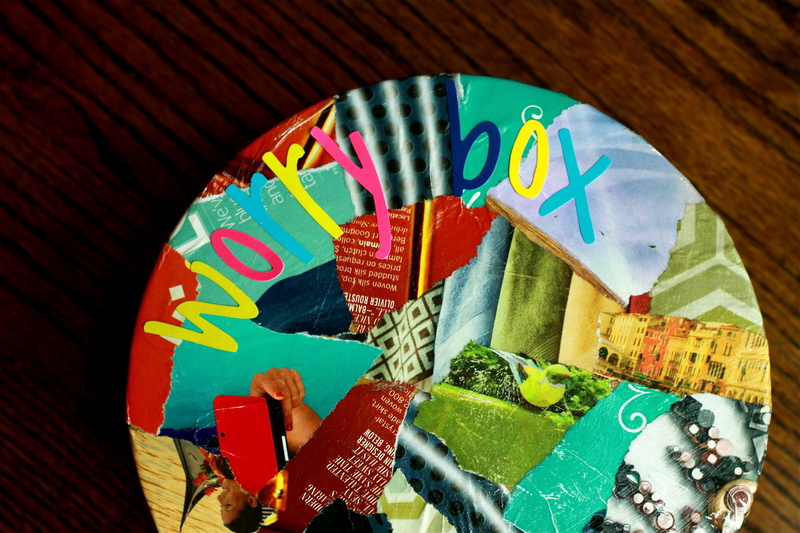 The Worry Box contents can also be supplied to a counselor or therapist when accessing a professional for assistance. How Does the Worry Box work? Keep your Worry Box in a convenient place, like the child’s bedside table or on a dresser. Instruct your child that whenever they have a worry, he or she should simply write down this particular burden – and put it in the box. Every night, open the Worry Box with your child and review the worries they’ve made note of. Talk about each worry, how he or she is feeling and share some ways to handle the problem causing the worry. With each review – you might find some of the worries have gone away on their own, while others might not and continue to be a talking point. If the worry has gone away, discard the written worry. Cheerlead your child for handling it! If the worry has not gone away, keep it in the Worry Box for another review. If the child makes it through a day without any “worries” celebrate this accomplishment. Touch base that this has been an honest achievement though. If the child is withholding or internalizing the worries – there may be an issue with feeling safe enough to make their report. By writing down their worries, your child can get a clear idea of what he or she is worried about. 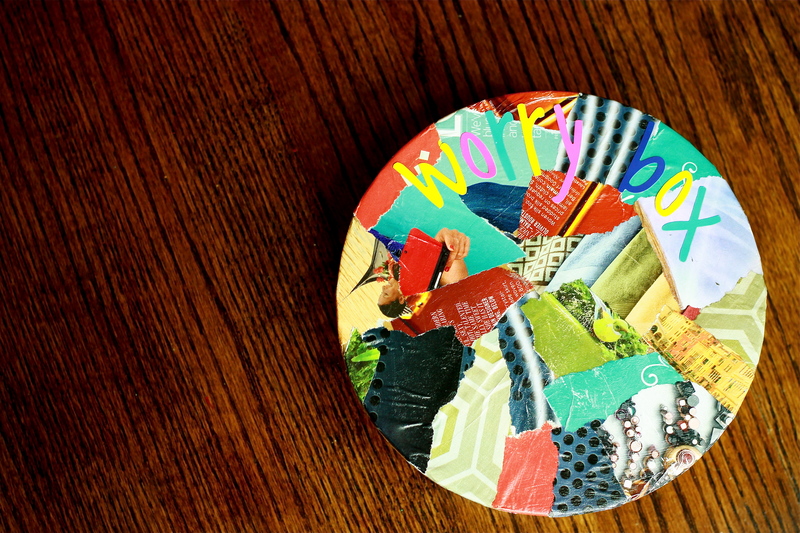 A Worry Box is a great facilitator of conversation and relating. Children who use a Worry Box know they will review the worries soon with an adult they trust, so they can express worries by writing them down and getting them out of his or her head for a while. When you bring out the box each time, explain that the first step in helping a worry is – acknowledging it. 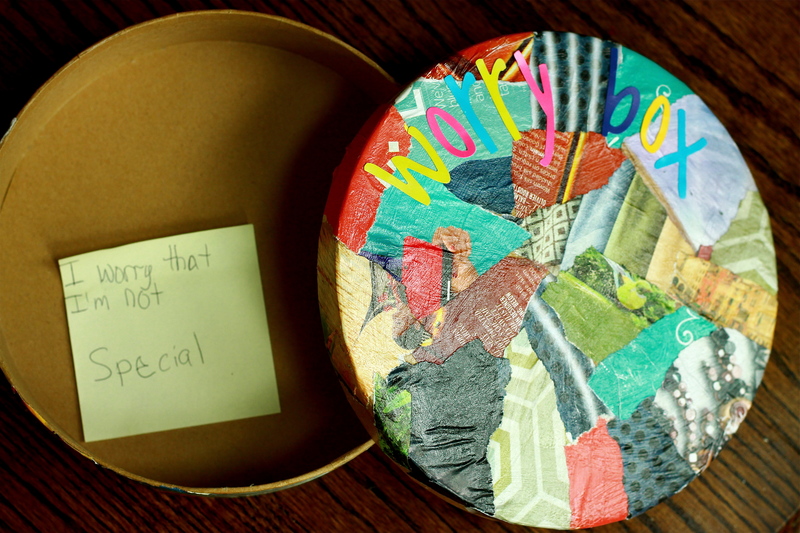 Second, the Worry Box sparks conversation between you and your child. Often, children can be uncomfortable or scared to bring up a worry out of the blue. The adult will get insight into what is on the child’s mind and the child will learn that the adult is “safe” for sharing their worries. Third, over time, your child may begin to learn better ways to manage his or her worries. A Worry Box helps your child recognize that some worries that are a waste of time and that by writing and talking about worries with a trusted person, your child can also find help to reconcile them. They celebrate progress as the worry is diminished and “thrown out.” They learn that the parent is a safe and non-judgmental resource to review their fears with. How do I help my child? I’m just not sure what to say? Help your child identify his or her worried (or irrational) thoughts by writing them down on a piece of paper. Help your child reframe his or her thoughts into positive or rational thoughts when you review worries with him or her. Help your child develop a healthy plan to help him or her reduce anxious feelings. How to make a worry box: This is quite simple. 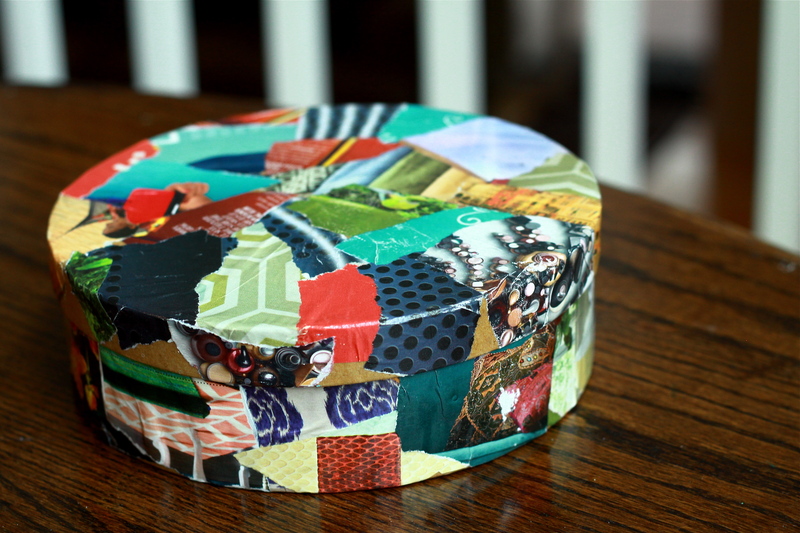 All you need is a box ~ you can use a shoebox or purchase a fancier shaped cardboard box at a craft store. Let your child choose embellishments to decorate the box with. Stickers, paint or drawings will do the trick. 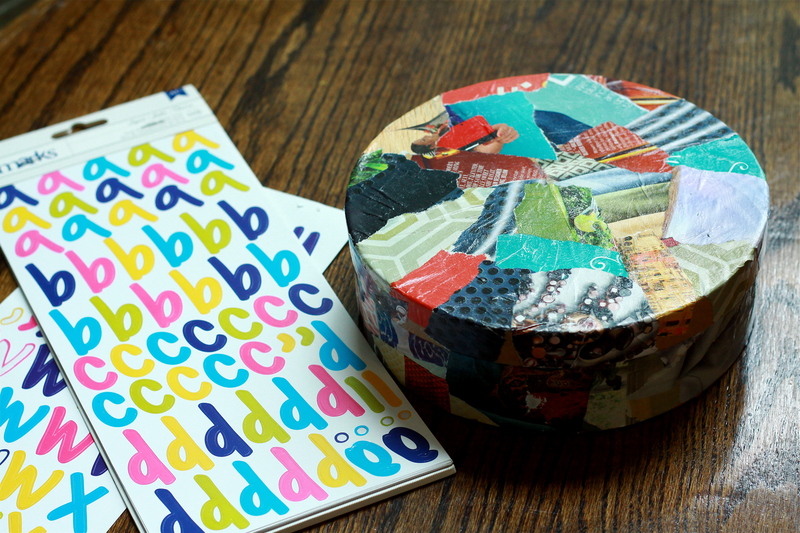 For the example, we used magazine pieces collaged to the box and individual magazine letters to label it. You can overtly label the box “My Worry Box” or your child can choose to be more discreet about it – so that the box doesn’t draw unwanted attention from friends/visitors. Place a pad of sticky notes or notecards alongside the box, which can be used to make note of the worries as they occur. Place the worries inside the box as they are written. If you have more than one sibling experiencing worry and anxiety – you can have the children create separate boxes or utilize a combined box. The parent will want to decide whether to address the worries separately or as a group. I would advise addressing them separately so as to – isolate the “worries,” keep them from spreading to the group, and to give individualized attention and support in overcoming the worry. If presented in a group setting: The parent should divert the other siblings from advice giving that is not helpful. Focus on the feelings of the person who wrote the worry, how the rest of the group relates and if they have ever experienced the worry themselves. You can then talk as a group about coping and turning our worries around. Pingback: How Do You Handle This Emotion Called FEAR ? | I've Got It!